Ok, I must admit these turned out pretty darned cute. My son’s teacher was retiring this year and I wanted to make a special treat for the class on the last day. So I quietly polled the kids to ask their favorite thing or something special they wanted to tell their beloved teacher. I put each sentiment on a 4″ sugar cookie in blue royal icing after coating the cookie in a white glaze. 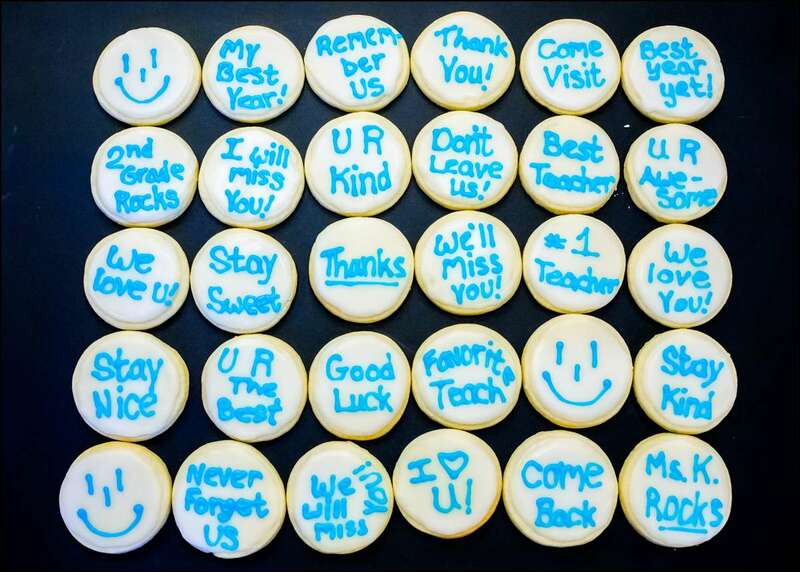 Since I knew the treats would be devoured as soon as I walked into the classroom, I took a picture and presented the teacher with a 5×7 glossy so she could keep their heartfelt good wishes forever. The teacher was very touched and the kids had a ball finding their quotes….and eating them, too!